(Seychelles News Agency) - The government of Seychelles plans to issue a blue bond valued at $15 million over 10 years with guarantees from the World Bank and the Global Environment Facility to support the transition to sustainable fisheries. The Seychelles blue bond project, which was one of three projects selected to be presented at The Economist World Ocean Summit held in Bali from February 22 to February 24, has been awarded with the 2017 Ocean Innovation Challenge. With tourism and fishing the main economic sectors, Seychelles’ large ocean provides most of the island nation's jobs. 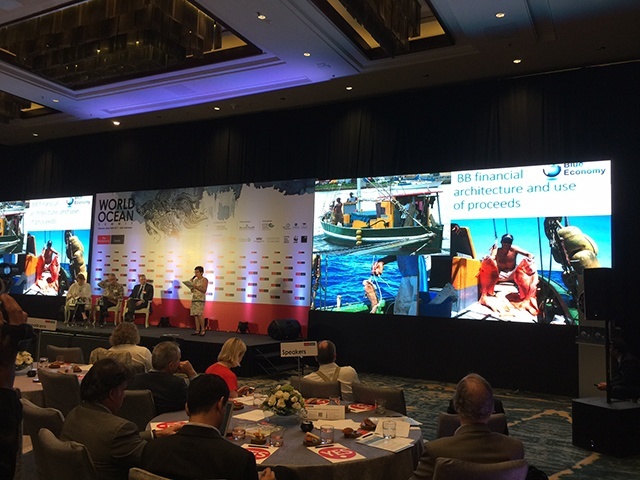 Maximizing the full potential of Seychelles’ ocean territory is central to its blue economy agenda. Seychelles' blue economy initiatives focus on economic diversification, food security and the protection and sustainable use of marine resources. Bonds are financial instruments to raise public and private capital for specific activities which can generate a return on investment. Blue bonds often fund the development of sustainable fisheries. The Seychelles archipelago in the western Indian Ocean has an exclusive economic zone covering 1.3 million square kilometres. The island nation’s economy depends heavily on tourism and fishing, two industries reliant on the Seychelles’ abundant ocean resources. “The blue bond project, soon to be finalized, is the result of the work of many from the original vision and leadership of the Minister of Finance, to committed partners such as the World Bank Group and the Global Environment Facility and the financial advice of Prince Charles Charities International Sustainability Unit” said Rebecca Loustau-Lalanne, permanent secretary for the Blue Economy Department. The proceeds of the blue bond will be used to as grants for fisheries management planning activities and as loans to encourage local public and private investment in activities consistent with sustainable fishing such as post-harvest value adding opportunities and jobs and the protection of ocean resources. The blue bond proceeds will be disbursed on a competitive basis through the Seychelles Conservation and Climate Adaptation Trust (SeyCCAT) and the Development Bank of Seychelles. The blue bond proceeds will also complement other publicly funded sustainable fisheries projects and the implementation of Seychelles Marine Spatial Plan of its Exclusive Economic Zone (EEZ), a commitment of the country’s debt swap for conservation and climate adaptation.